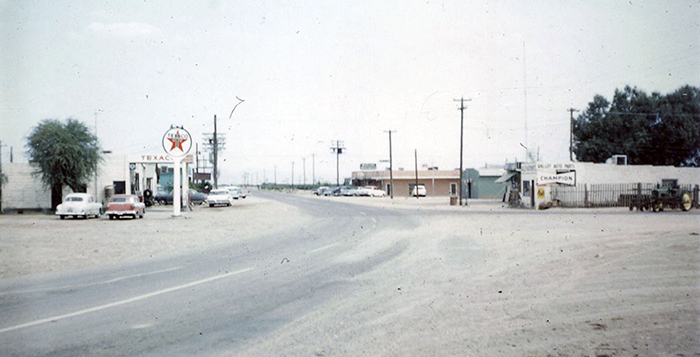 At the intersection of Maricopa Road and the future Maricopa-Casa Grande Highway in the 1950s was the business district north of the tracks. At left are the Texaco Station, Woods Apartments and Headquarters. At right are Valley Auto (now Napa Auto), Jessie Estep’s Diner, Black Diamond Bar and Maricopa Mercantile. In 1956, Maricopa Road was paved between Maricopa and Phoenix. In 1995, Maricopa Road (State Route 347) was restructured to a divided road. Maricopa-Casa Grande Highway was completed in 1956 and paved in 1959. This photo appears in the August issue of InMaricopa.